The first 12 weeks were a whirlwind and it feels like so much happened, so here we go! I want to do an update for each week of pregnancy like I did with Taylor, but the updates will be more "Things I Want To Remember" like any doctors appointments, how I am feeling, milestones, etc. 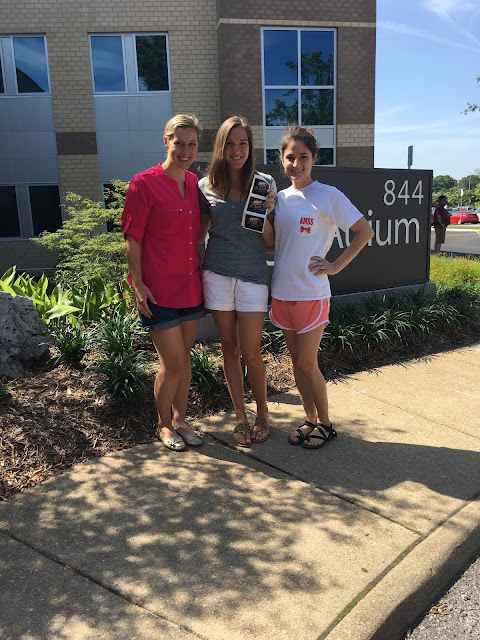 The first 12 weeks were jam packed, and there is so much I want to remember! I have had more doctors appointments than normal since I am considered high risk. 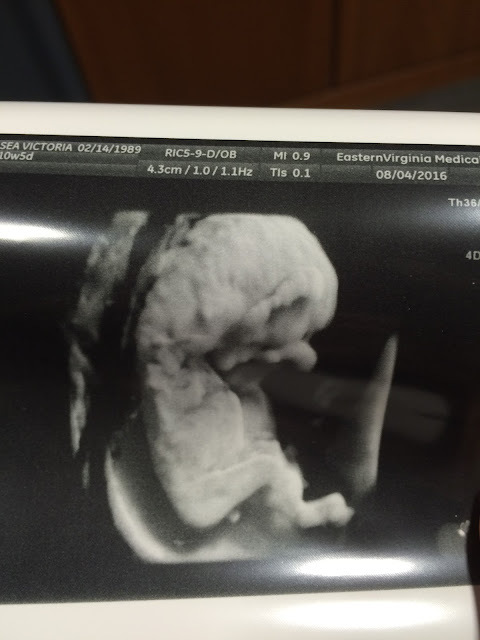 Baby and I are both doing great and perfectly healthy, but I am considered high risk because of my first pregnancy. In this case, that just means extra care, and I can't complain about that! We found out we are pregnant! I was actually about 3.5 weeks along, so I found out very early. Around week 4.5, the nausea hit and would only get worse. Bring on the symptoms! Acne, round ligament pain, and scent aversions were the other big ones that would come into play this pregnancy! Parker and my twin were the only two that knew at this point. The nausea goes into overdrive, and I start having aversions to pretty much all food. I started telling my friends. We tried to tell as many people in person as possible, which is why our families wouldn't find out for another 5-6 weeks. 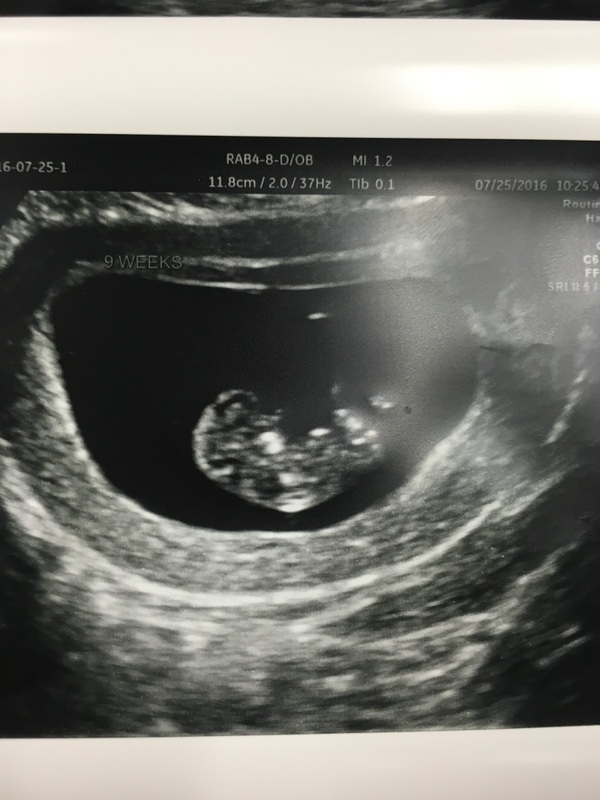 I had my first doctor's appointment/ultrasound on July 5th, and the heart was beating at 127 bpm! They dated me at 6w3d, making my official due date February 25th. The heart was beating which was really all we could see/hope for at this point, but the doctor did find a small sub-chorionic bleed. I had one with Taylor, and while they are common, they are scary and can really harm the baby. There was nothing I could do but take it easy on the physical activity, so all exercising stopped for the time being. I was honestly too sick to exercise anyway! We were scared but prayerfully confident that God would protect this baby. My two friends Jenn and Karly came to this appointment with me so I wouldn't have to go alone. Love these two girls! Nausea was at an all time high, and I struggled to get through each day and find food to nourish me and this growing baby. I was never sick with Taylor, so this first trimester really rocked my little world. I know nausea is a good sign, so I prayed and prayed and prayed that I would be sick, and the Lord definitely granted that. The baby is healthy, so it has all been worth it, but I have been able to eat very little and actually lost weight in the beginning. Goldfish, red grapes, and Spaghettios were my go-to's. I had another doctor's appointment at 9 weeks and got a surprise ultrasound since it was a little too early to find the baby's heartbeat with the doppler. The heartbeat was going strong at 176 bpm and the sub-chorionic bleed was nowhere to be found. Praise God! I started believing baby was a girl with the high heart rate and my other symptoms. Parker was convinced it was a girl too! I flew internationally to go visit my favorite person- this is only notable in the "Things I Want To Remember" because nausea and long flights do not mix. That said, I would go again in a heartbeat, and seeing him was all worth it. I had an in-depth ultrasound at 10w5d with the high risk specialists to check for the soft markers of any chromosomal abnormalities. 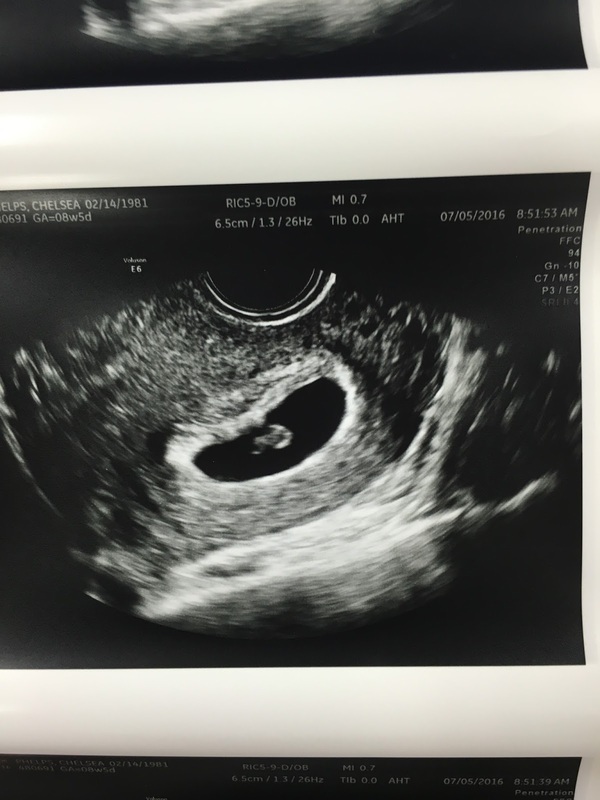 The heartbeat was 167 bpm, and baby was actually measuring a week ahead at 11w5d! I've never had a baby measure big before! The ultrasound went great, and the baby looked perfect. They even turned the 4d on for a second! I finally got to tell my mom when she flew to Virginia! I told the rest of my immediate family! I got the phone call I had been waiting for from the genetic counselor with our test results! The test came back negative for trisomy 13, 18, 21, and triploidy. Praise God!! We also found out we are expecting a BOY!! More details on that later this week! The tiniest little bump made it's debut! I was shocked to start showing so early but thrilled! We told Parker's extended family and called the rest of our families that we wouldn't be able to see in person. Everyone knows now! We announced on social media, and the secret was officially out! That's a wrap on the first 12 weeks! It wasn't always easy, but it was always worth it. We feel so blessed by this healthy little boy and wouldn't change the first 12 weeks for anything! I am SO glad that everything is look good for baby boy!! :) I am loving the updates so far. Congratulations! Praise God for another pregnancy and healthy baby! Keeping you all in my prayers. Very excited for you guys! I am so incredibly happy for y'all! I was just thinking about y'all and how you've been doing! I haven't been keeping up with blogging or reading blogs lately, so this is a very exciting "welcome" back into reading blogs! Seriously, I'm so happy for y'all!!! I'm keeping y'all in my thoughts and hoping for a very healthy pregnancy. George kept me sick the first trimester too, which also made me think he was going to be a girl. I will have to say thought that there are parts of me that were ok that we had a high risk pregnancy because it meant I could see and hear him at least every other week. I am so glad to see that things are going well for his growth! Yay! You're due two days before my sister-in-law!